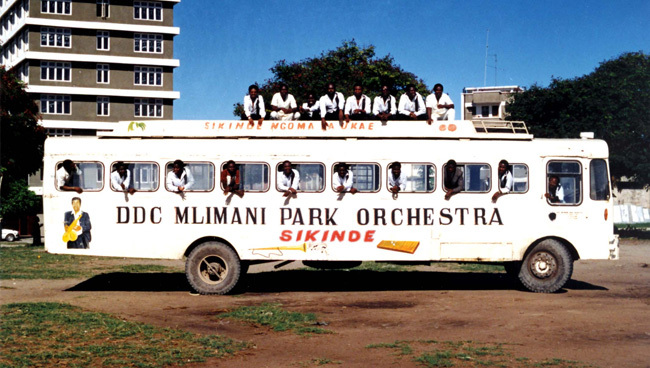 35 years into their life Mlimani Park Orchestra are still the leading exponents of Tanzanian muziki wa dansi. The band set out with a bang in 1978 when some of the principal musicians of leading bands like the Nuta Jazz and Dar es Salaam Jazz Bands got together to form the new house band of the Mlimani Park Bar hence the group’s name. 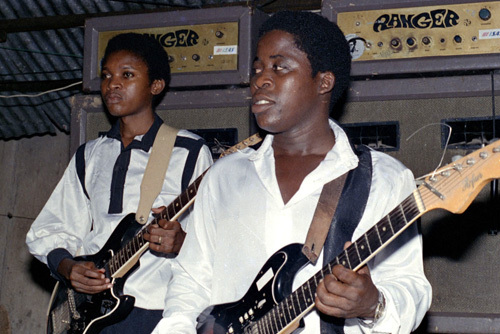 The band was first managed by the Tanzania Transport & Taxi Services, owners of the bar at the foot of Dar’s University Hill. It was changed to DDC Mlimani Park Orchestra when bar and band were taken over by the Dar es Salaam Development Corporation (DDC) a wing of Dar city council. We have to remember that we were still in Ujamaa, African socialist times, hence the basic modus operandus of most musical groups (and society in general) as part of state or para-statal organizations. With changing times and the move towards a more liberal political and economic order, Mlimani Park and its musicians finally became an independent organization in 2009. At the outset Mlimani was led by Muhiddin Maalim Gurumo and Abel Balthazar, both mainstays on the Tanzanian scene and long time members of the Nuta Jazz Band formed in 1964. The band was soon joined by Hassani Bitchuka (also formerly of Nuta), whose high pitched voice has kind of become the orchestra’s identity, together with the Muhiddin’s lower pitched tenor. 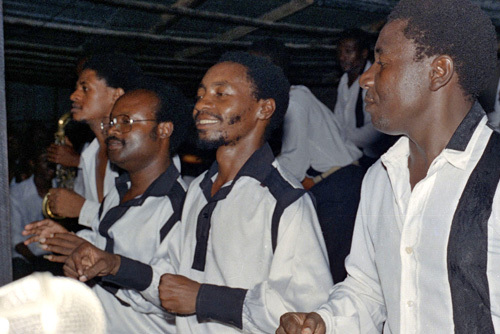 Muhiddin also introduced the band’s mtindo (style) Sikinde – Ngoma ya Ukae, Mlimani’s take on a traditional Zaramo ngoma/dance. Mlimani have cooed their way into the hearts of Tanzanians with an endless string of hits sung and composed by the likes of Bitchuka, Gurumo, Shaaban Dede and Cosmas Chidumule. In Tanzania the first and foremost way of appreciating a song is through its lyrics. Mlimani are famous for their themes and the intricate poetry delivered by their lead singers. Good, topical lyrics are a general feature of Tanzanian music, however, and it is really Mlimani's instrumental sounds – the interplay of the guitars and the finely honed horn arrangements - that are their trademark, qualifying them as one of Africa's outstanding bands. Though composition and arrangement are usually group processes in Tanzanian dance music, the final authority in Mlimani was “King” Michael Enoch, whose knowledge and experience was the force behind the development of the distinct Mlimani sound. 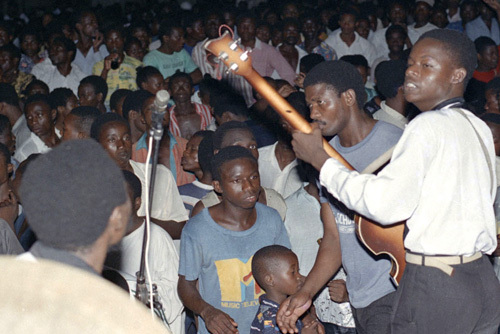 Enoch has been a legend since he joined the Dar Es Salaam Jazz Band in 1960 as a solo guitarist. He soon became the bandleader and developed into one of Tanzania's leading solo players and composers, a multi-instrumentalist who has taught many Tanzanian musicians. These include the late Mbaraka Mwinshehe, who (first with the Morogoro Jazz Band and later Super Volcano) was to become the most popular East African artist of the 1970s. 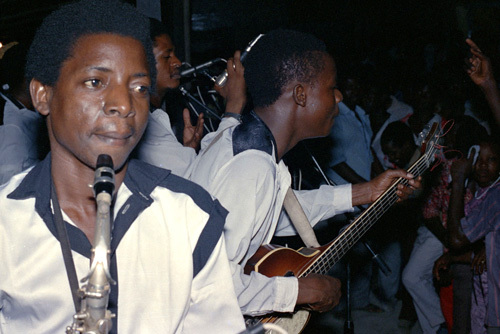 With Mlimani, Enoch started to play the saxophone and also taught the other members of the horn section. He hears his horn arrangements as being based on local folk melodies and instruments like the nzumari (a local double reed instrument). In Tanzanian dance music songs the first part is usually slow, giving the audience the chance to savour the lyrics. In the second part the heat then builds up with interchanges between the vocals and the horn section, which finally gives way to rhythm and pure melodic invention by the guitars. The performance reaches its peak as the solo and rhythm guitars work into each other in the chemko climax section, while the bass player adds yet more rhythmic excitement for the dancers to follow. Most of the dancing is based on popular street ngoma like the mdundiko, or the audience may do a gwaride, a line dance, which will soon include the stage as well. Mlimani's performances are usually tumultuous affairs, with dancers going wild and the audience all over the stage slapping appreciative tuzo (tips, banknotes) onto the musicians' sweaty foreheads. 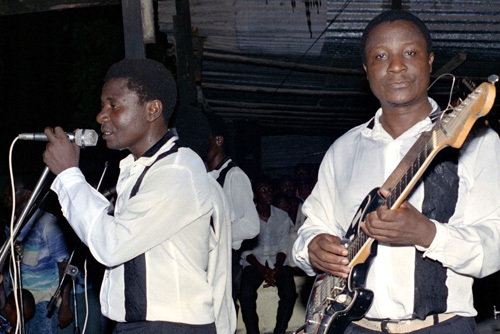 While some of the elders and erstwhile leaders of musical creation have either died (Michael Enoch, guitarist Joseph Mulenga, bass player Suleiman Mwanyiro) or moved on to other bands (Gurumo, Dede), the band is guided by founding member and drummer Habibu Abbas, while in the vocal chores Bitchuka is competently supported by Abdalla Emba, Hassan Kunyatta and Yassini. Solo guitarists Ramadhani Mapesa and Maufi Mohamed play those smooth melodic lines that sing and burn and the same time. Maufi also doubles on rhythm guitar together with energy man Mjusi Shemboza. The death of bass giant Mustafa Ngosha, and just recently of Shaban Mabuyu, has left Tony Karama as the sole bass player. 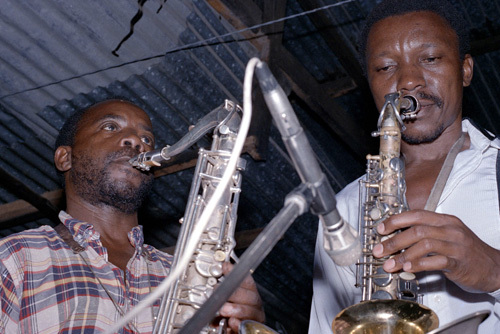 The foundation and fire within is provided by Choka Mzee on drums & Ally Jamwaka on tumba; saxophones and trumpets are still in the hand of some of the band’s veterans providing Mlimani’s signature brassy question-and-answer games: Hamisi Mirambo & Ally Yahaya trumpet; Joseph Bernard saxophones. Catching Mlimani Park at one of their regular live-gigs around Dar is still a treat for those accustomed to night entertainment under a starry tropical sky. Having followed the band around the city since the early 1980s, I vouch that they have lost none of their drive and passion. Just recently in October 2012 Jahazi Media recorded a show at their regular Saturday night spot Pentagon Bar in Dar es Salaam’s Kurasini area. The CD is slated for release later in 2013. 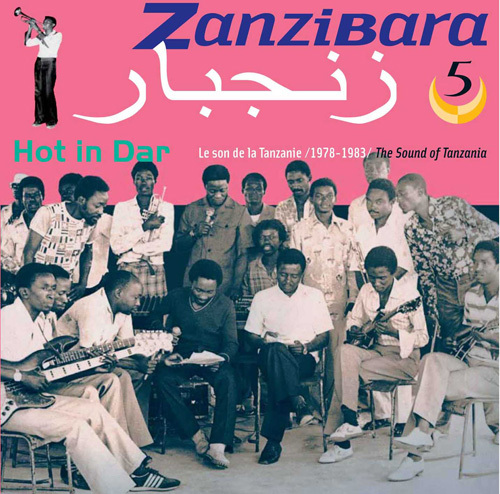 For those who can’t wait: Early recordings of Mlimani Park Orchestra dating to the band’s initial years are featured on Volume 5 of the Zanzibara Series: “Hot in Dar”. 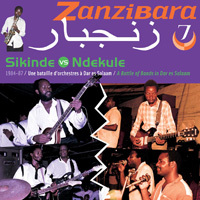 Some of the band’s later songs from the mid-1980s can be found on the just released Volume 7 “Sikinde vs Ndekule”.